Mediums 1, 2, and 3 — These fluid mediums are made with pure acrylic resin emulsion (Mediums 2 and 3 also contain silicic acid). Mix them with acrylic paints to increase transparency and adhesion, slow drying time, and extend yield. Lightfast, colorless, and age-resistant, they are ideal for creating glazes and also excellent for embedding lightweight collage materials. Medium 1 dries to a waterproof, clear gloss film and may be used as a final varnish (though it dries to a softer film than Lascaux Varnish). Medium 2 dries to a waterproof matte film and is also excellent as a colorless sizing or primer for canvas and paper. It is not recommended for use as a varnish. Medium 3 dries to a waterproof, transparent, satin matte film and will not change the sheen of the paint when added to acrylics. It may be used as a final satin gloss varnish. Structura Light Modeling Paste — This ultra-lightweight and absorbent modeling paste holds stiff peaks with minimal color alteration. It features a fine-grained, sandable surface that is flexible and hard when dry. Its lighter weight makes it ideal for large-scale applications. Also try it as a ground for pastels. Semi-Matte Varnish — Use this product to achieve a semi-matte protective film. It is well suited for all Lascaux color ranges. Use it to protect acrylic, oil, tempera, and pastel paintings, drawings, watercolors, and inkjet prints on virtually all papers and other supports. Gloss Varnish — Yields a lustrous protective film. It is especially well suited for use with Lascaux acrylic paints, other brands of acrylic paints, oil paints, as well as oil pastels. Use also on inkjet prints and photos on all supports. When using on water-soluble paints or on paintings with thin paint layers, it is recommended that a suitability test be carried out before widespread use. Matte Varnish — Yields a matte protective film. 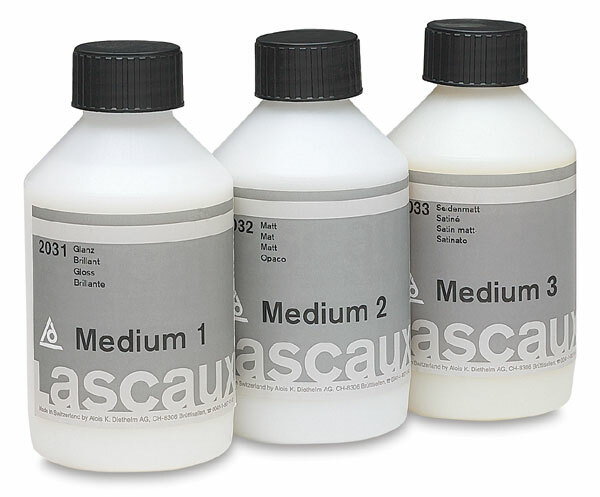 It is well suited for all Lascaux color ranges and for gouache, drawings, oil, tempera, watercolor, acrylic, and oil pastel paintings. A pretest is recommended before using this product on inkjets, as it has limited suitability for such prints.